2015 is now drawing to a close for us all…regardless of the kind of year; good, bad, or ugly…we will be closing the chapter. Our prayer for you and for all of us is that we will choose to remember the good, learn from the bad, and accept that our loving heavenly Father has a purpose in it all and promises to use it for our good. We haven’t had any additions to our family in 2015 but are anticipating the arrival of our “China Baby” by way of the pending adoption to The Growing Table family. Little ones are loved and cherished and we will all be sad when the little ones are big; but each age and stage is precious and brings blessings and joy. 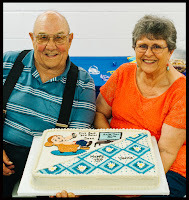 We have celebrated a lot of birthdays this year…and two in particular were celebrated together as Grammy's Dad turned 80 and her Mom turned 75. We enjoyed a family reunion around the celebration and were only missing a few. In May, we attended the All School Reunion in our beloved small Kansas home town and loved taking the opportunity to catch up with school friends. The hospitable folks of our home town put things together in fine fashion and we had a great time! In May we also saw our oldest granddaughter, Lou Lou, promoted from 8th grade. She is a freshman now and it boggles our minds to think we actually have a high school grandchild! Our youngest grand just turned one and with 26 of us in our immediate family, we are a crowd! In early October we flew to Charleston, South Carolina to attend a wedding near there. If you caught the national news you saw that areas of South Carolina experienced what is referred to as the “Thousand Year Flood” and we felt fortunate to drive out of the state before the water got too high in the red Ford F150 we purchased while there that is now dubbed “The Ark” because it saved us from that flood and got us home! Also in October we enjoyed our family for our annual fall party at the farm. Pop and I have tried in recent years to surprise the grandkids with our costumes and this year we were Gru and Lucy Wilde from Despicable Me 2. The littlest ones were not sure what to think of Pop with his mask! Pop has hunted, golfed, and fished…and Grammy has attended a women’s retreat, bible study, a Beth Moore event and spent a little time with her folks…but not as much as either of us would like since we’ve traveled so much! I guess we have some things to look forward to when Pop retires someday. We hope to sleep a little more, see our grandkids and kids a lot more, have more time for things at the farm (including friends coming to visit), and to just laugh and enjoy life with more time together.